1 Find A Grave, (accessed 01/30/2012). 2 NEHGS NEXUS: New England Across the United States, 1987, Vol. 4, p. 27, New England Historic Genealogical Society (Online Database). 3 The Virginia Magazine of History and Biography, Virginia Historical Society, OCT 1946, Vol. 54, No. 4, Page 339, JSTOR (Digital Library). 4 Hayden, Rev. Horace Edwin, Virginia Genealogies: A Genealogy of the Glassell Family of Scotland and Virginia, Wilkes-Barre, Pennsylvania: E. B. Yordy, Printer (1891), 15, Google Books (Digital Library). 5 Patton, Robert H., The Pattons: A Personal History of an American Family, New York: Crown Publishers, Inc. (1994), xi. 6 Pecquet du Bellet, Louise, Some Prominent Virginia Families, Vol. 4, Lynchburg, VA: J. P. Bell Company (1907), 427. 7 Slaughter, Rev. Philip, A History of St. Mark's Parish, Culpeper County, Virginia, Baltimore, Maryland: Innes and Company, Printers (1877), Internet Archive (Digital Library). 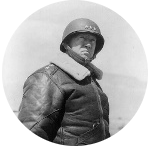 8 Wikipedia, "George S. Patton, Sr", (accessed 01/30/2012).